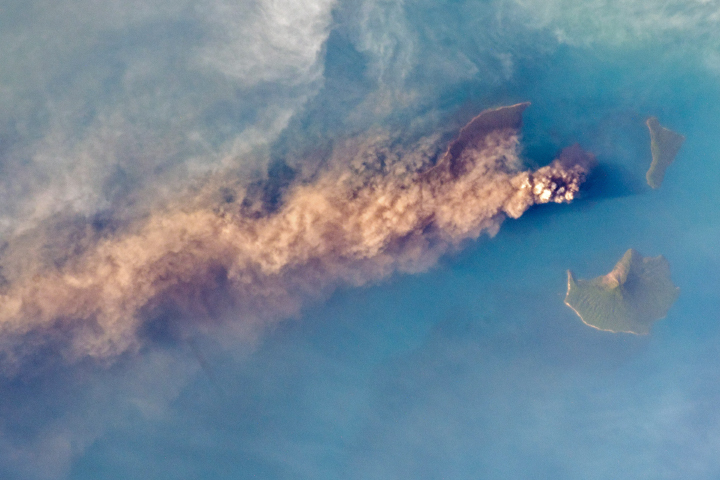 The last big eruption at Hokkaido’s Kuttara volcano happened roughly 40,000 years ago, about the time Neanderthals were going extinct and a bit before people had begun to domesticate dogs. 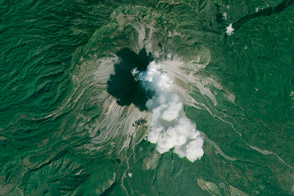 Earlier eruptions at the Japanese stratovolcano had produced thick andesitic lavas that flowed into two large tongue-shaped lobes immediately north of the volcano. Silica-rich, viscous magma blocked the vent, so pressure built up in much the same way it does in a soda bottle after it is shaken. When the pressure grew intense enough, it blasted a vent at the top of the volcano and sent a large plume of ash shooting into the air. Fast-moving jumbles of ash, gas, and other debris—known as pyroclastic flows—swept down the southwestern slope of the volcano. 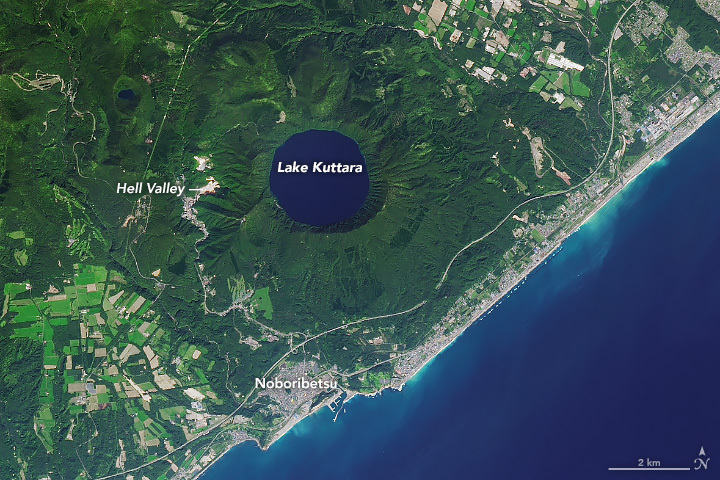 That explosive eruption—and the slumping of rock into the emptied-out lava chamber—sculpted the bowl-shaped caldera that now sits at the top of the mountain and holds Lake Kuttara, one of the roundest and clearest lakes in Japan. 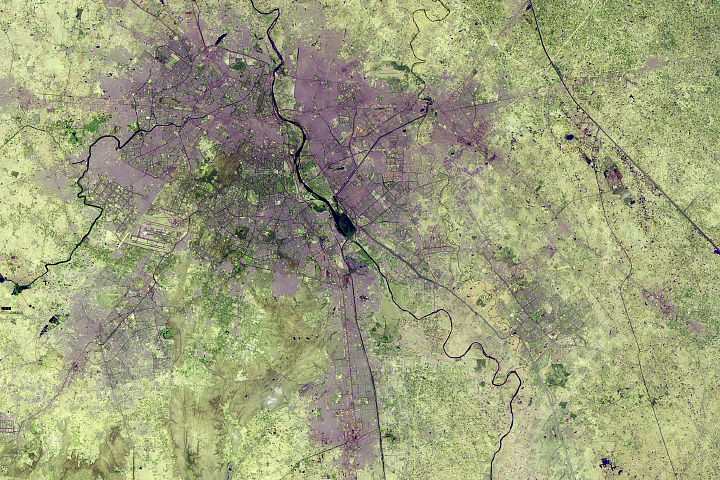 The Operational Land Imager (OLI) on Landsat 8 acquired an image on September 15, 2015. 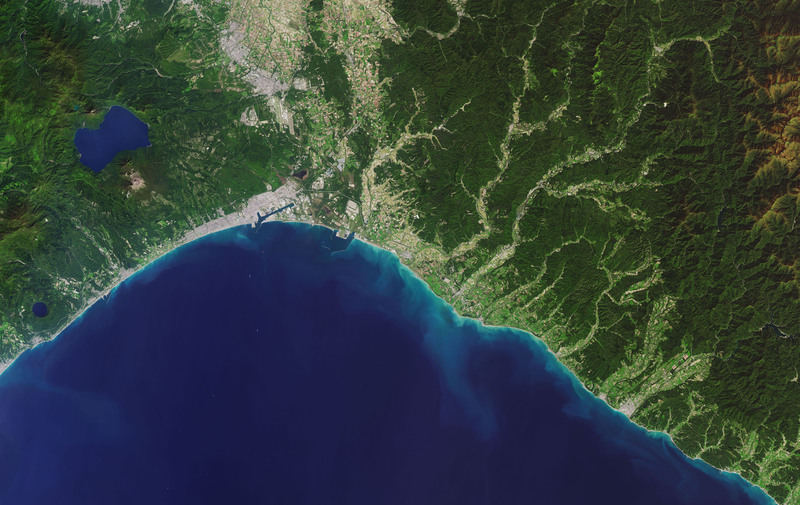 For the three-dimensional view, the Landsat 8 image was draped over a global digital elevation model built from data acquired by NASA’s Shuttle Radar Topography Mission. 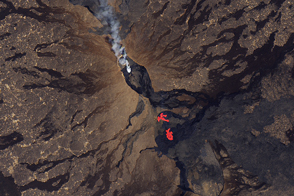 Following that explosive eruption, volcanic activity at the caldera calmed and geothermal activity shifted to the southwestern slope of the volcano. About 15,000 to 20,000 years ago, viscous lava began to bulge upward into a lava dome, and a series of small steam explosions gouged several craters into a valley of fumaroles, geysers, streams, and ponds. This exotic, steaming landscape persists today. Known in Japanese as Jigokudani (Hell Valley) for its rusty red and black terrain, visitors can follow a walking path through the treeless valley, along a hot creek with a popular natural foot bath. They eventually arrive at sulfurous Lake Oyunuma, which has a surface temperature of 50 degrees Celsius (122°F). The lingering volcanic activity in the area has fueled the development of several onsens, or hot spring spas, that have made Noboribetsu one of the most famous spa towns in Hokkaido. Millions of people visit each year to soak in the natural mineral-rich waters from Lake Oyunuma and Hell Valley. 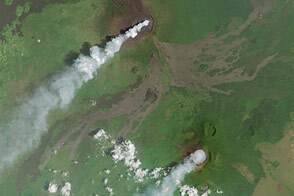 NASA Earth Observatory images by Joshua Stevens, using Landsat data from the U.S. Geological Survey and topographic data from the Shuttle Radar Topography Mission (SRTM). Story by Adam Voiland. Circular, tranquil Lake Kuttara has an explosive past. Atlas Obscura (2018) Jigokudani (Hell Valley). Accessed September 24, 2018. BBC (2015, May 11) In Japan, hell is due north. Accessed September 24, 2018. Global Volcanism Program (2018) Kuttara. Accessed September 24, 2018. Goto, Y. & Johmori, A. 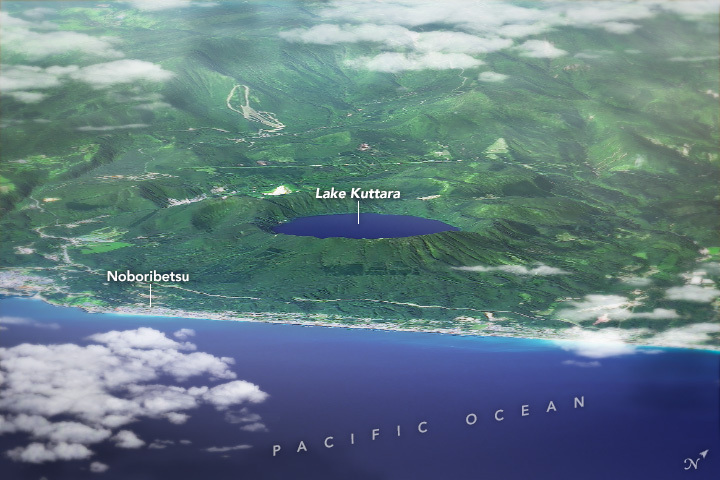 (2015) Internal Structure of Kuttara Caldera, Hokkaido. Bulletin Volc. Soc., 60 (1), 35-46. Japan Meterological Agency Kuttara. Accessed September 24, 2018.